"A Great Staging of a Brilliant Musical"
“Floyd Collins” is a brilliant new musical given an absolutely gripping production at the Shaw Festival. This is one of those wonderful instances when every element of the production from the performances themselves to the set, costumes and lighting comes together to create an overwhelming experience. The 1996 musical is based on the true story of Kentucky spelunker Floyd Collins, who searched various caves around his home in Barren County hoping to find another cave system like Mammoth Caves and make his fortune by turning it into a tourist attraction. Instead, on January 3, 1925, while Floyd was exploring Sand Cave he found himself trapped in a tight hole 150 feet underground. Skeets Miller, diminutive cub reporter for a Louisville newspaper, heard of the story and was the only one small enough to squeeze through to Floyd where he interviewed him. His dispatches, later winning Miller a Pulitzer Prize, were syndicated nationwide and the publicity soon generated the first media circus of the 20th century with people camping out awaiting Floyd’s rescue. The same story with names and location changed, served as the basis for the 1951 Billy Wilder movie “Ace in the Hole” (aka “The Big Carnival”). Tina Landau’s book for the musical avoids the pervasive cynicism of the movie. Instead, the musical focusses on the human drama of a man whose dreams of fame and rescuing his family from poverty bring him face to face with death. The musical looks at the effects of his plight on his family and friends and charts the course of how their hopes for his rescue fade the longer he is trapped and how they accommodate themselves to this reality. The musical does depict the rise of the media circus and the bullying of an overconfident engineer H.T. Carmichael who thinks his superior technology can rescue Collins and gain publicity for his company. But ultimately, the story is about Collins, his younger brother Homer and his sister Nellie, a former mental patient, and how they cope with the collapse of their dreams. As befits the time and setting, Guettel’s music is tinged with bluegrass throughout. Though there is dialogue and there are separate numbers, Guettel’s musical language is so advanced that the effect is far more like a folk opera than a typical musical. The intricacy of the music and the beauty of Guettel’s word-setting will convince you that here, finally, is someone after Sondheim who has moved the musical genre forward. The singing and acting of the entire cast blaze with commitment. Jay Turvey’s incandescent performance takes us with him through Floyd’s entire emotional arc from his joy in caving, his wonder at discovery, through his pain, attempts to cheer himself up and despair, to his accommodation with fate and his final ecstatic vision in “How Glory Goes”. Jeff Madden gives his best-ever performance as Homer, who alternates between anger and dread and attempts to distract Floyd from his loneliness and pain. The heartfelt singing of these two forms the show’s emotional core. No less intense are Glynis Ranney as Nellie, who feels mystically connected to Floyd, and Jeff Lillico as Miller, whose joy at getting such a big story turns to guilt when he sees the gaudy results. Sharry Flett and Peter Millard, not usually associated with musicals, fit right in as Floyd’s worried stepmother and his stern, religious father. Douglas E. Hughes plays the engineer Carmichael as selfish and misguided but keeps him from being a simple villain. As three reporters Andrew Kushnir, Marcus Nance and Sam Strasfeld stop the show in “Is That Remarkable?” with their intricate three-part harmony, their precise, synchronous moves and crisp rapid-fire delivery. At first, you might not think that the Court House Theatre was the best venue for this musical. But when Floyd discovers a large chamber in Sand Cave and the entire ceiling of the theatre lights up, you’ll suddenly feel as if you were in the cave with him. Indeed, director and choreographer Eda Holmes uses the entire theatre to draw the audience into the action with the stage at times representing a level surface in the valley made by the surrounding raked seats, at others the pit of the cave where Floyd is trapped. William Schmuck’s ingenious set has the rocks above and below ground represented as cement-coloured stacks of bundled newspapers, thus cleverly suggesting both the media circus that surrounded the event and the reason why we know of it today. Kevin Lamotte lights the show in inventive ways rarely seen at the Court House. Besides the glittering cave ceiling, he gives us fireworks overhead, the bitter winter light above ground and shafts of light piercing the gloom below. Musical director Paul Sportelli draws soulful playing from an eight-man band including banjo and harmonica partially hidden upstage of the proscenium. “Floyd Collins” is a long way from the frothy musical comedy with its kick-line of chorus girls. 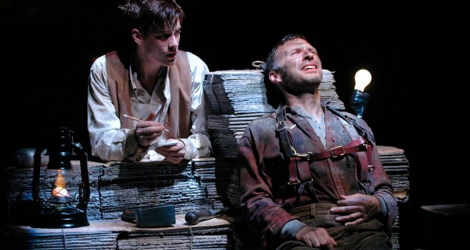 Shunning cheap laughs and cheap sentiment, “Floyd Collins” is that rarity, an authentically moving work of musical theatre. The Shaw’s totally involving staging makes this an experience you won’t want to miss. Photo: Jeff Lillico and Jay Turvey. ©2004 Shaw Festival.